I’ve recently published a couple of posts on using an XPEnology setup as part of my existing home lab. I’ve gone though a number of hardware iterations during my testing – really to see what works and what doesn’t. These posts have proven to be surprisingly popular – it seems that a number of people on the internet are as interested as I am about building a micro NAS be it for a home lab or general ultra small network attached storage. I am getting a number of questions coming though, either via the comments, my contact form or through related search terms, so here are my thoughts. 1 Where can I download XPEnology? 2 What are the minimum hardware requirements for XPEnology? 3 Whats the best XPEnology device for production? 4 Can you use update in Synology DSM in XPEnology? 5 Which Hard Drives are best for an XPEnology NAS? 6 Can I use external drives with XPEnology? 7 Can I run XPEnology on ESXi / HyperV / Virtual Box? Where can I download XPEnology? 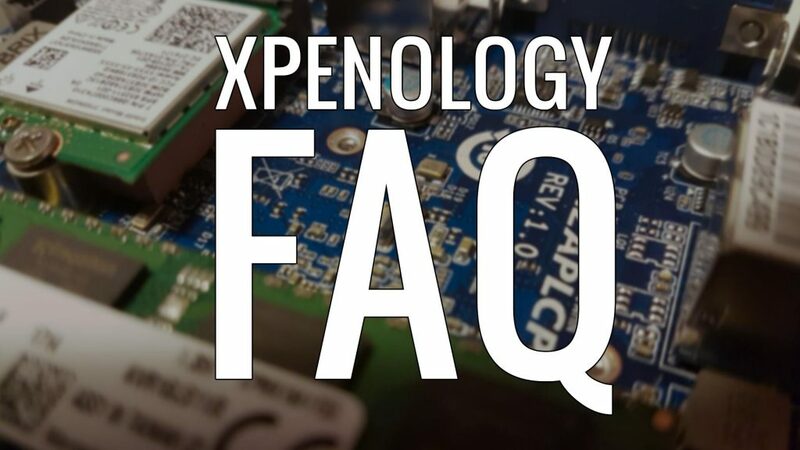 What are the minimum hardware requirements for XPEnology? As I proved in my Building a DIY Synology NAS post, you can build an XPEnology based NAS on some fairly low-end hardware. In fact, some of the mid-range SOHO hardware in the Synology line up only runs on basic x86 CPUs such as the Intel Celeron N3150 – See the DS716+ as an example. Check out the Synology CPU/NAS comparison guide for more info. Obviously, if you are planning on running additional services from the NAS then you may want to plump for something a little more beefy than my basic spec. I’ve found that the XPEnology project runs fairly well on most of the hardware that i’ve tried so you can initially get started by dusting off that old PC you may have hidden in the loft. I know i’ve blogged about it before but I think the HP Gen8 Microserver is an ideal basis for an XPEnology NAS – Its got the right hardware (including twin ethernet), space for 4 x 3.5 inch drives (+ an SSD with a few mods) and can be picked up for just over £100 if you can get the cashback deal. Whats the best XPEnology device for production? The XPEnology project takes the publicly available source code for the Synology OS and modifies it to allow it to run pretty well on non-Synology hardware. Its free, un-supported (beyond a couple of forums) and completely unwarranted so use it at your discretion. If you want to use the Synology range of hardware in a production environment with business critical data, then you need to invest in the “proper” hardware. The XPEnology project is designed for homebrew type setups, home labs and tech enthusiasts. If you do however want to install and configure XPEnology on “enterprise grade” hardware, you can follow my XPEnology install guide for generic hardware. I did recently find a superb guide on how to configure and install XPEnology on a 45 drives Storinator over on Thomas Kay’s Blog. Thomas also goes into detail on how to edit the Synology config files so you can use all 45 drives present in the system. Its a great post and well worth a look. Can you use update in Synology DSM in XPEnology? Again it’s bad news, I’m afraid that you can’t. Even though the mechanism exists in XPEnology to download the latest version of the DSM software (6.1 at the moment) – you can’t actually do anything with it. XPEnology uses a custom boot loader that uses a modified version of the Synology DSM files available online. You do have the option to boot up in “upgrade” mode using the XPEnology boot USB that you create as part of the install process (see below) but you need a copy of the latest official version of the XPEnology software to upgrade. Personally i’ve not yet needed to update the XPEnology install to any other version as its running fine for my current requirements. Which Hard Drives are best for an XPEnology NAS? While any hard drives will work in an XPEnology NAS I do have a couple of recommendations as to the types of drives that i’d invest in. Personally, I’d go for either Western Digitals RED line of drives, or Seagate’s Ironwolf range. Both of these series of drives are designed for use as part of a network attached storage setup. They excel in the hot, high vibration environments that you’ll typically find in closely packed clusters of drives that you’ll find in most NAS devices. SSD’s are a viable choice for drives in a XPEnology build, however I would avoid the cheaper, lower capacity drives. These don’t have the endurance or the capacity to be useful. I’d recommend going for a higher endurance option such as the Intel S3610 series of drives. Can I use external drives with XPEnology? You certainly can, however you need to think carefully about how you use them. XPEnology, just like the Synology software its based on fully supports using external drives for data storage – Synology even sells expansion units for their NAS units (check out the RX2417sas and the DS1817+ for examples). In a home brew XPEnology setup you can use external drives in the same way. You can pick up a (fairly) cheap JBOD USB enclosure such as the IcyBox IB-3620U3 from Amazon and achieve the same effect. You can also pick up standard external hard drives and use them as well. I would however advise caution about using this kind of external drive as extra capacity in an internal disk pool, especially externals based on laptop hard drives. Your NAS will only be able to operate as fast as its slowest drive. If you have 4 x 1TB 7200rpm drives internally, and you expand to include a 1TB 5400rpm external, the whole array will run at the lower speed. You also need to be aware that if the external drive is disconnected for whatever reason, the system will see this as a drive failure – and you’ll need to rebuild the array when its reconnected. I personally think the best use of small external drives is part of a backup solution, or if you need to move a lot of data between NAS’s, but as long as you are aware of the limitations, you can do pretty much anything you like. Can I run XPEnology on ESXi / HyperV / Virtual Box? I generally use Virtual Box for my test installs and run a small virtual NAS running on HyperV in my own small home lab. Its as easy as setting up your virtual machine (i’d recommend a minimum of 2 x virtual hard drives and at least 2Gb RAM), attaching the XPEnology boot ISO (note – the ISO version not the img version) booting from that and then following my XPEnology Setup Guide. Easy. This virtual setup has the benfit of allowing you to mess around with adding and removing drives to simulate drive failure and test the advanced failover and recovery options of the DSM software – all without risking your existing hardware. Its early days for this XPEnology FAQ, it’s very much a “living document” and will likely change and expand over time.